The Ouray Ice Park is a free, outdoor park for ice climbing on the sheer walls of the Uncompahgre Gorge just south of town. The ice is created by drawing water from the city reservoir, piping it to the end of the gorge’s cliffs, and then spraying it through 300-plus spigots. The park is on private land leased to the city, and it is run by volunteers from the nonprofit Ouray Ice Park. The park began operation in 1994. The Ouray Ice Festival, held each January, brings together ice climbers, gear manufacturers and spectators for a weekend of competition. The festival was launched in 1996 and is regarded as the top event of its kind in the world. 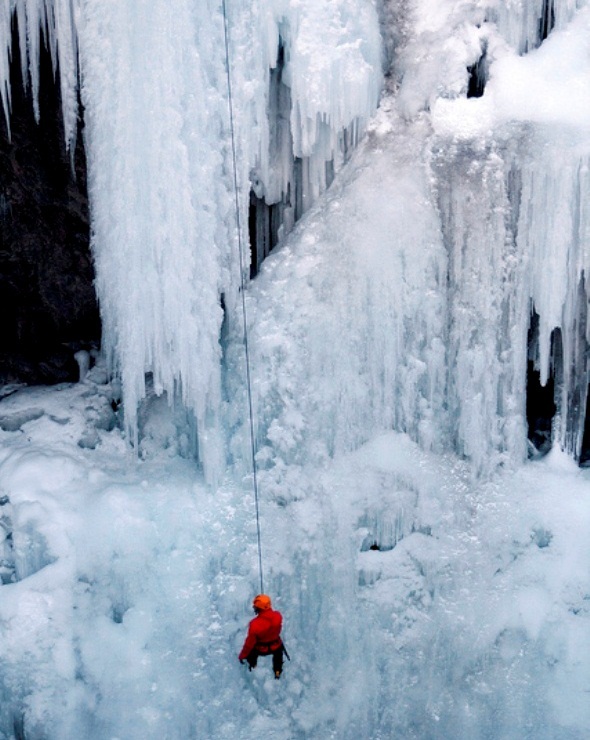 Ouray is ranked as one of the world’s most popular locations for ice climbing, with numerous other ice-climbing routes in the mountains beyond the Ice Park. The park is open from mid-December until early April, weather permitting. It is located just off U.S. 550 on Camp Bird Mine Road, a 10-minute walk from Ouray. Park right before the bridge that crosses the gorge.